Help extend the life of your carpet with the Hoover<sup></sup> Trubo Scrub Carpet Washer. Designed to clean many carpeted and fabric surfaces in and around your home. Make cleaning a breeze with spill free tanks that are easy to access, easy to fill, empty and clean. The Turbo Scrub features SpinScrub<sup></sup> multiple brush system. 2 year limited manufacturer warranty on parts and labour. For more information please contact our customer service team at 1-800-944-9200. Keep up with the weekly laundry with this 4.0 cu. ft. I.E.C. capacity high-efficiency washer. Its smooth, porcelain tub resists tears and scratches to protect fabrics better than plastic tubs. You'll experience consistent cleaning and gentle wash action with our High-Efficiency Agitator and Wash System. Plus, an easy-to-fill fabric softener dispenser releases the fabric softener at the right time in the cycle. For those times when you want more water, the Deep Water Wash cycle fills the tub during the wash and rinse cycles so you can be confident you're getting a great clean. And, if you forget to add a garment after the cycle's started, Late Lid Lock gives you until the Spin cycle to throw it in. Compact Multi-Purpose Deep Cleaner uses hot water and a cleaning agent to eliminate both deep-down dirt and surface spills. Designed especially for cleaning vehicle interiors, it also works great on carpeting, stairs and upholstery in the home. Strong spray and suction remove tough spots and stains. Permanently removes tough beverage stains like coffee, soda & Juice. Be prepared for unexpected messes with the convenience of the BISSELL Little Green ProHeat. It permanently removes spots and stains from wherever you find them using water, BISSELL formula, and handheld cleaning tools with powerful suction. From high-traffic areas and stairs, to upholstery, auto interiors, and more, you have the ideal cleaner in the SpotClean. The 3" Tough Stain Tool works great on everyday spills while the 3-in-1 Stair Tool sprays, scrubs and suctions up dirt and stains from the outer curves, corners and treads of carpeted staircases. The ability to quickly erase stains the first time is finally here. The BISSELL SpotClean Professional portable deep cleaner combines powerful vacuum suction, scrubbing action, and cleaning solution for professional cleaning results removing stubborn dirt and tough stains. 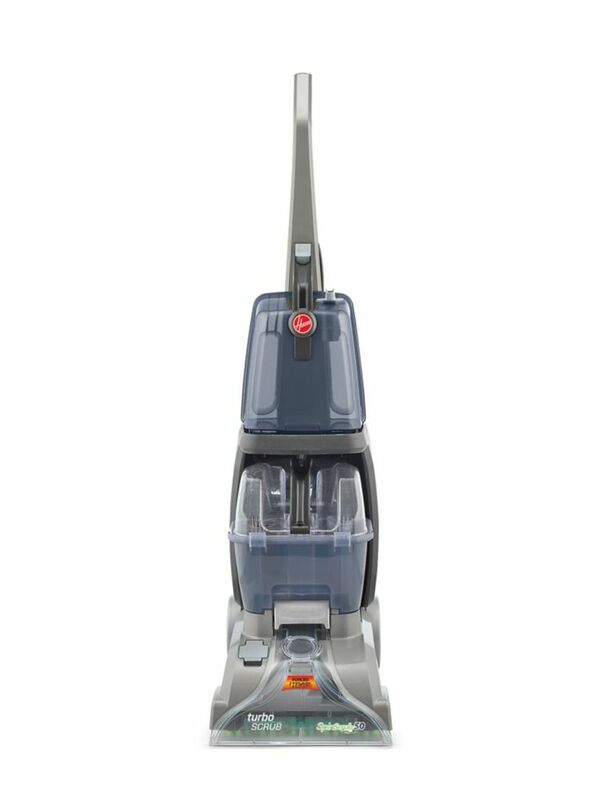 Designed to easily clean carpet, upholstery, stairs, area rugs, auto interiors, and more. Large-capacity, 3/4-gallon tank allows you to clean more area without emptying and filling the tank. For versatile cleaning, BISSELL SpotClean comes with professional tools including a 3-in-1 Stair Tool and a Tough Stain Tool. Equipped with a long hose and a 22-ft. power cord to make it easy to clean hard-to-reach areas such as rugs, stairs, and upholstery. Turbo Scrub Carpet Washer Help extend the life of your carpet with the Hoover<sup></sup> Trubo Scrub Carpet Washer. Designed to clean many carpeted and fabric surfaces in and around your home. Make cleaning a breeze with spill free tanks that are easy to access, easy to fill, empty and clean. The Turbo Scrub features SpinScrub<sup></sup> multiple brush system. Turbo Scrub Carpet Washer is rated 4.5 out of 5 by 654. Rated 5 out of 5 by TR from Super easy to use, great price (on sale). I can't believe I used to rent carpet cleaners. Super easy to use, great price (on sale). I can't believe I used to rent carpet cleaners. Rated 5 out of 5 by Christine from We had a renovation and the drywall dust was everywhere. We bought this in hopes we could save th... We had a renovation and the drywall dust was everywhere. We bought this in hopes we could save the carpet in the bedroom. It exceeded my expectations. The suction power was amazing and it pulled so much dirt out of the carpet. I actually thought about buying another one since they were on sale. Rated 4 out of 5 by Missy from The carpet cleaner works great! My only complaint is about the owner’s manual. The instructions a... The carpet cleaner works great! My only complaint is about the owner’s manual. The instructions are extremely vague when it comes to the “solution tank”. Turns out it’s not a “tank” but more of a measuring tube in which you measure out the solution and pour into the water tank. Aside from that, works great! Very lightweight and seems durable. Have had and used for about a week. Rated 5 out of 5 by HomeDepotCustomer from Very little assembly needed. Worked miracles on our stained carpet.... Very little assembly needed. Worked miracles on our stained carpet. Rated 5 out of 5 by Mary from This is a great product. I was very pleased... This is a great product. I was very pleased with the Suction power, how easy it was to operate. I Would recommend this product. Rated 5 out of 5 by John from It has very good suction and I have noticed the... It has very good suction and I have noticed the pet stains have no smell to them if I use this when they make a mess. How abrasive are the brushes, I have a wood barbour carpet (small loops), I'm worried it will ruin it, does it have the option to lift the burshes to put less pressure on the carpet? No, you can not adjust the brush roll level. Does this cleaner come with the hard floor attachment? Hi Natalie. There is no hard floor attachment for this. The Turbo Scrub is meant to wash carpets and upholstery only.